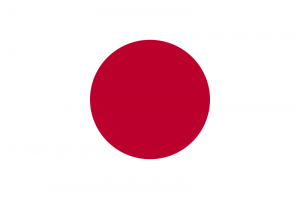 The country with the highest number of traders involved in foreign exchange and effecting the largest collective trading volumes on a retail basis is Japan by a long shot. 2013 saw record trading volumes by Japanese Forex brokers, some of whom had more than $1 trillion worth of trading volume in months such as April when global FX volumes had reached their highest. Although as a financial center it has lost its place in ranking to Singapore (by a tiny margin), according to the latest BIS triennial survey, moving from 3rd to 4th place among the centers transacting the highest amounts of market share of global Foreign Exchange volumes (in April 2013), Japan still dominates the retail FX rankings by a significant margin, according to Forex Magnates’ research. Due to the sizeable economy, transparent and efficient regulatory infrastructure and framework for online retail forex trading operations, many Western companies seek to establish operations in Japan. With many of the largest brokerages already operating within the country, and new entrants preparing to make way after successful regulatory approval with the Japan’s Financial Services Agency (FSA), Japan remains a top choice for financial services firms looking to acquire market shares in a major market. As 2013 comes to a close, a look at how the year fared with 2012 will provide a gauge for expectations of 2014, along with the expectations of the Quantitative and Qualitative Easing (QQE) introduced in April of 2013, and new rules that went into effect enabling Binary Options trading to proliferate in the country, alongside traditionally traded Spot FX and options on currencies. 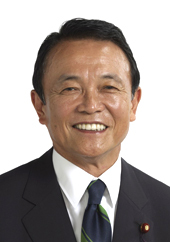 The efforts of the Japanese to jump start their economy and escape the deflationary spiral that has been in place since the 1990’s, appears to be producing results as the latest Tankan report showed the year-on-year rate of change in the CPI (all items excluding food and energy) turned positive at 0.3 percent in October, the highest rate of increase in 15 years since August 1998. 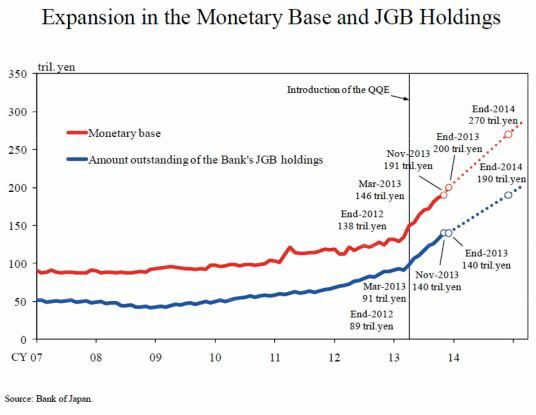 An excerpt below, sourced from the Bank of Japan (BOJ), shows the expansion of the Monetary Base and Japanese Government Bond Holdings including a projection of future levels based on the current QQE program continuing. With the Bank of Japan (BoJ) eager for a constant inflation rate of 2% that could help complement a recovery if GDP can stay in positive territory with the help of the QQE program, its plan for the next six years is aimed ahead at the 2020 Olympics in Tokyo. According to a speech by BoJ Governor Haruhiko Kuroda, at the Meeting of Councillors of Nippon Keidanren (Japan Business Federation), in Tokyo on December 15, 2013, the Japanese economy is currently in the process of trying to leap back to a positive equilibrium and sustainable economic growth and overcoming negative deflation by fostering growth expectations, and that this is the main theme of Abenomics, which includes three points summarized in bold monetary policy, a flexible fiscal policy, and a growth strategy to stimulate private investment. One source of stimulus can be found through the use of Corporate Savings by investing the funds more actively into private sector businesses. The amount of Cash and Deposits in Japan has been on the rise for almost 20 years, as can be seen in the chart to the right. With regards to public and quasi-public funds, such as the Government Pension Investment Fund (GPIF), necessary measures should be taken in line with the Final Report of the Panel for Sophisticating the Management of Public/quasi-public Funds (released on November 20, 2013), which recommends a review of the fund management and governance structures in view of the exit from deflation, according to a recent paper by the BoJ. 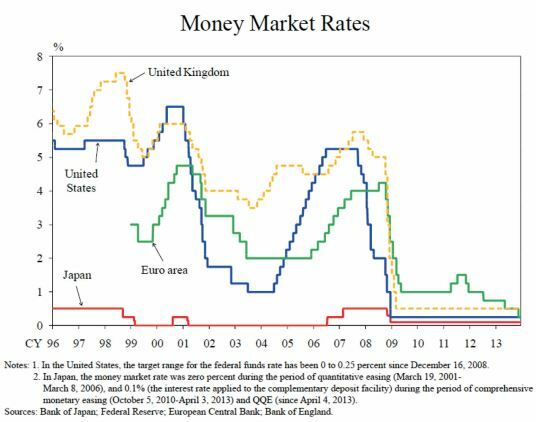 With interest rates long close to zero even during times when rates were much higher in other major economies, Japan could be the first to experience the positive effects of a low interest rate environment combined with recent quantitative easing. 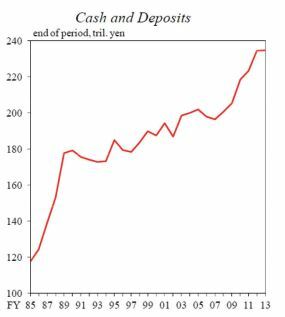 However, Japan is not a stranger to stimulus packages and thus its challenges that lie ahead may remain just that — challenging. The effects of Abenomics have been attributed to record volumes at venues such as the CME vis-a-vis the Japanese Yen volatility, which during 2013 the USD/JPY pair traded between 86.76 and as high as 105.40 in today’s session. The overall volatility in the pair during that time has been noted as a driver of volumes for many firms. The Nikkei Stock Exchange YTD has increased from nearly 10,000 points at the start of the year to just over 16,000 in recent days and hitting a fresh six-year high today, yet still far off its all-time high just under 40,000 in 1989, at the peak of the Japanese Asset Price Bubble. A collaboration between the Japan Exchange Group, Inc. and Tokyo Stock Exchange (TSE), Inc. and Nikkei Inc. which will launch the JPX-Nikkei Index 400 that will start to be calculated on a real-time basis starting on January 6, 2014. 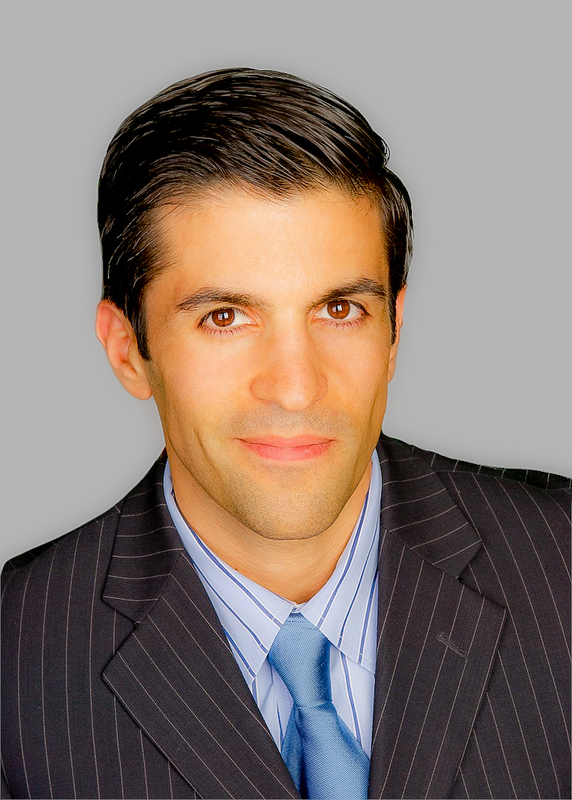 The new index can be used for the promotion and development of products that can track the index, and the proactive use of the index by a broad range of investors including public and quasi-funds which is also expected, along with the possibility of brokerages creating CFD derivatives and binary options contracts, both domestically and abroad. According to a description on the TSE website, the new index will be composed of companies with high appeal for investors, which meet requirements of global investment standards, such as efficient use of capital and investor-focused management perspectives. The new index is described as aiming to promote the appeal of Japanese corporations domestically and abroad, while encouraging continued improvement of corporate value, thereby aiming to revitalize the Japanese stock market. Excerpts of the main points for Financial Business Operators, of which there are currently nearly 1,600 firms registered as such (holding various license types such as type I and Type II) with the J-FSA. A full copy of the below excerpt can be found on the FSA website. 1. Environment surrounding financial and capital markets, and expected roles of Financial Instruments Business Operators, etc. Financial Instruments Business Operators, etc. are expected to function as effective market intermediaries and contribute to fair price formation of financial instruments. Financial Instruments Business Operators, etc. are also expected to contribute to increasing the funds available for growth (e.g., proactive market intermediation, product- development/offerings contributing to customers’ wealth creation, effective consultation, etc.). It is important to make responsible and timely business judgments, and formulate medium to long-term business strategies covering the next 5–10 year period. Under the basic policy to make Better Regulation further embedded and enhanced, the FSA will take the following approaches as the supervisory authority. Financial administration, if implemented through regulations only, may cause distortions in the regulatory regime and result in excessive control, which may negatively impact the real economy. In view of this, the FSA will endeavor to improve the quality of supervisory administration while reducing regulatory costs on a medium to long-term basis by improving the self-discipline of financial institutions and its own capabilities as supervisory authority. i. Financial supervision and administration with high risk sensitivity (identify and understand the risks that can accumulate in each operator and in the financial system with a forward-looking perspective, promote risk-based supervision, and inspect IT systems and business continuity systems). ii. Financial supervision and administration from a citizen’s and user’s point of view (improvement of customer protection and convenience for users). iii. Supervisory response with a forward-looking perspective (Being aware of the progress in international discussions, monitor environmental changes, and consider common structural issues faced by Japanese Financial Instruments Business Operators, etc.). iv. Supervisory response which contributes to Financial Instrument Business Operators, etc. improvement of their management and better business judgements (straightforward and in-depth dialogues with Financial Instruments Business Operators, etc., promotion of the innovative initiatives by Financial Instruments Business Operators, etc.). * Closer coordination with the Securities and Exchange Surveillance Commission, self-regulatory organizations, and the Bank of Japan. Encouragement of Contribution to Increasing Funds Available for Growth The FSA will encourage positive actions toward effective market intermediation under appropriate internal control systems. Verification of Progress in Developing Sales Systems for Introduction of NISAs. Product offerings incorporating the purpose of NISAs, appropriateness of solicitation, and the status of sales system development. Prevention of Inappropriate Rigging of Benchmark Interest Rates, etc. 1. Encourage implementation of reliable liquidity risk management considering the progression in international discussions. 2. Encourage enhancement of group-wide governance system and risk management system. Preparation for Business Risks of Firms’ Management by (Domestic and Foreign) Small and Medium-sized Securities Companies and Investment Managers , etc. Examine the effectiveness of measures for responding to deteriorated financial positions and difficulties in liquidity, etc. Monitoring of the situation of customer assets protection and involvement of anti-social forces, etc. and strengthen coordination with industry groups. Initiatives for Monitoring Various Funds. Sales Systems,etc…The FSA will encourage implementation of measures to ensure that customers (especially elderly customers) understand product/risk characteristics and measures for prevention and early detection of potential problems. Approach to Type II Financial Instruments Business in view of the case of MRI, the FSA will strengthen its monitoring functions, further improve information analysis capabilities, and enhance the system for financial supervision.